With my current position as a fabric rep for Blank Quilting [see My Fabric Rep Trek postings], I have limited time in my schedule for teaching knitting and quilting classes. When I do get the opportunity to get back into the classroom, however, I am always appreciative of completed projects that students bring in for a quick, pre-class Show and Tell. Here are some examples of the fabulous handiwork of my talented students. 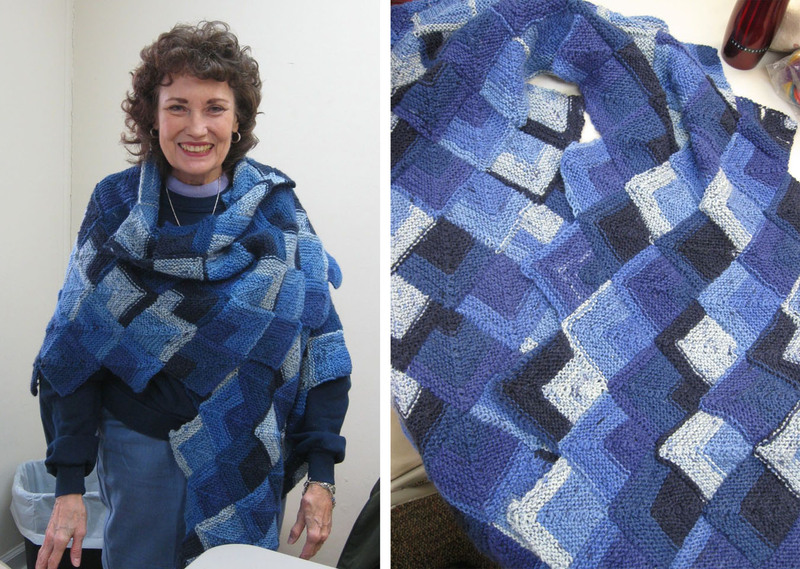 Irene completed her Shades of Blue shawl from my design-your-own Mitered Diamond workshop. Irene was in my beginning knitting class just last fall and has been fearless in tackling and accomplishing advanced knitting techniques. Irene and her Shades of Blue mitered diamond wrap. 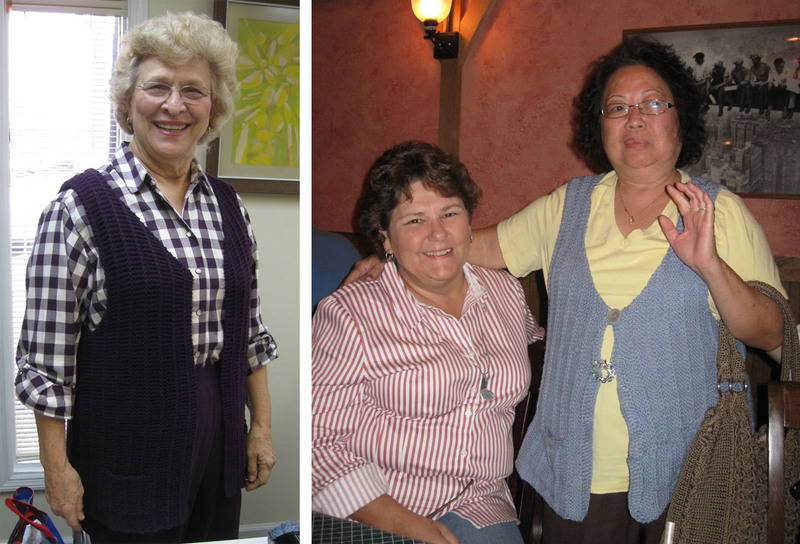 Lois and Ofie finished their Cool Cotton Vests made with Universal Yarn Cotton Supreme. One of the bonus techniques in this knitting workshop was the inclusion of a lined pocket. This vest also had the option of a top button closure. As you can see, some chose to put on a button... some did not. Lois (left) and Ofie (far right) in their summer cotton vests. 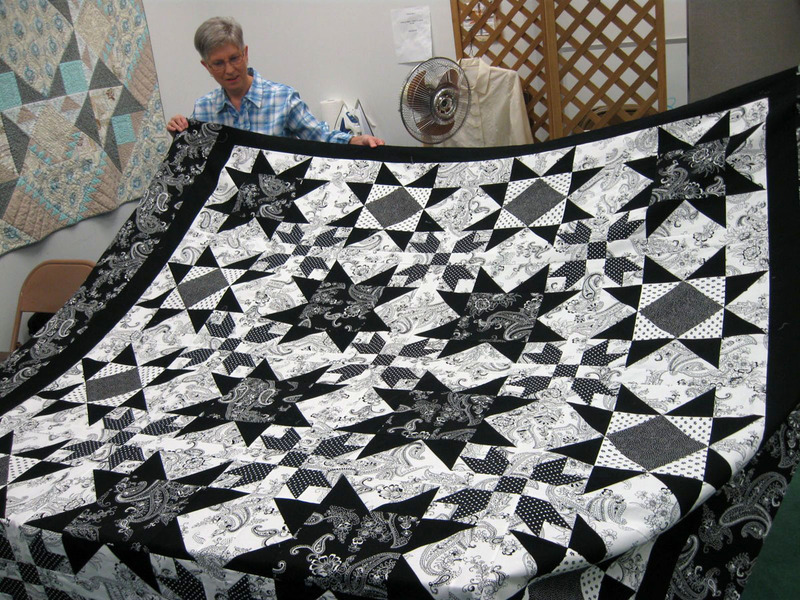 Jenny's black and white queen size quilt top. 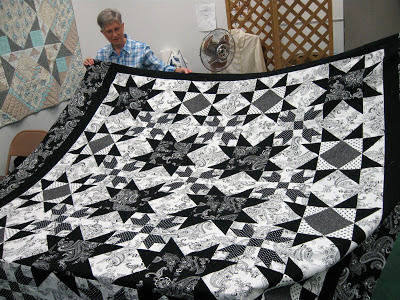 Another very prolific quilter from my Beginning Quilting class is Sue. She made this Lone Star quilt for a grandson. He chose the colors and fabrics for the star. The lime green against the hot red orange and purples make it sparkle! Go bold with color and you get spectacular results. Sue's Lone Star quilt for a grandson. Sue has an embroidery sewing machine, so she used the in-the-hoop quilting motifs to quilt this full size quilt. 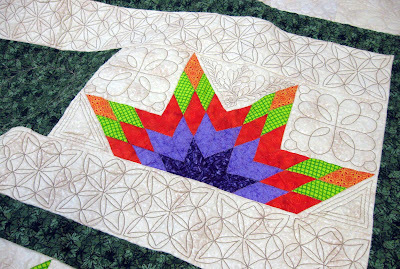 She scaled the digitized motifs to fit the various size pieces in the patchwork (setting triangles, background, borders, etc.). 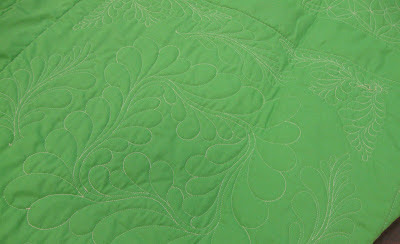 Below is a view of the back of the quilt. She used a lime green solid fabric to complement the front. 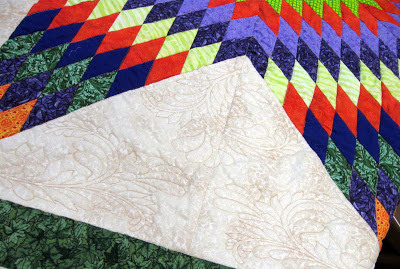 Detail of the quilting on the quilt back. 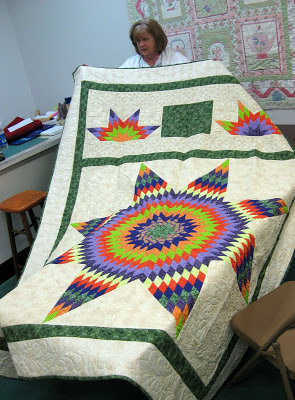 The center star and the half stars were quilted in the ditch. A contrast in value between the color of the the thread and the background fabric enables you to really appreciate the sampler of quilting motifs. The contrasting thread adds to the texture and print of the background fabric. 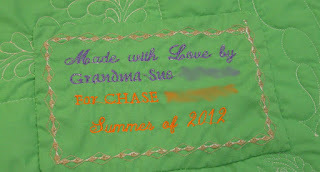 Sue also embroidered the label for the quilt to document her gift of love for a special grandson. 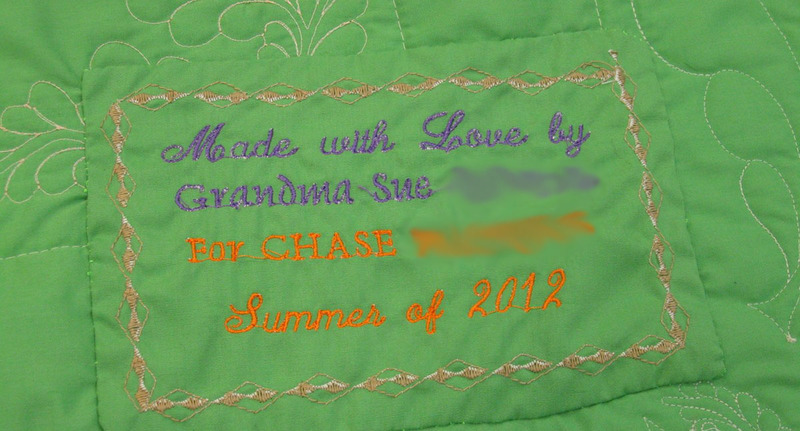 Always remember to include a label on your quilt! It can be handwritten with a fabric marker, embroidered by hand or machine, printed from your computer, or made by a variety of methods. The label documents your work and celebrates you, your talent, your creativity and your place in history.